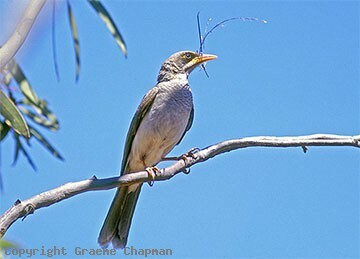 The Black-eared Miner has a chequered history. Whether you regard it as a species or a subspecies of the more common Yellow-throated Miner depends on which publication you read. Nevertheless, a pure Black-eared Miner is a distinctive form and sought after by most keen birdwatchers. To put it simply, the Black-eared Miner is a form that evolved in the closed mallee communities of north-west Victoria and eastern S.A. prior to the clearing of much of that country for agriculture. Before clearing there was limited interaction between the Black-eared and Yellow-throated forms - they are both very closely related and you could say that the Black-eared was well on its way to becoming a distinct species, but even then, there were the occasional "hybrids". Post clearing, the once relatively isolated populations of Black-eareds were swamped with invading Yellow-throated Miners that benefited from the opening up of the country. Hybrids of one sort or another became common. 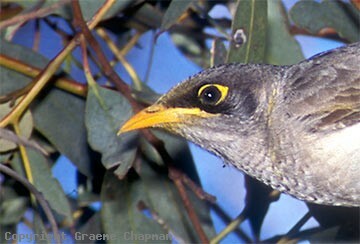 These days, most people who want to see a Black-eared Miner go to Gluepot Reserve in South Australia where a small population of fairly "pure" Black-eareds persist. 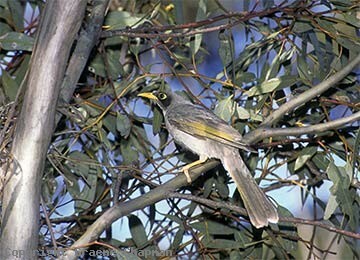 A research programme has been ongoing there for some years which involved, amongst other things, a plan to re-establish birds into suitable habitat in northern Victoria. 636201 ... Black-eared Miner approaching nest, Gluepot, S.A.
636202 ... This is a fairly pure-bred Black-eared Miner.